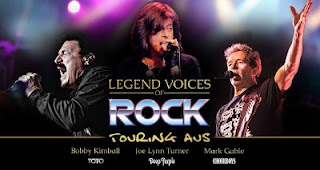 Bobby Kimball of Toto, Joe Lynn Turner of Deep Purple and Rainbow and Mark Gable of Choirboys will tour Australia in September. Kimball was the lead singer for Toto and the voice of the hits Africa, Hold The Line and Rosanna. Joe Lynn Turner was in both Deep Purple for the 1990 album Slaves and Masters and with Rainbow for the three albums Difficult to Cure, Straight Between the Eyes, and Bent Out of Shape. He was also the backing singer for Michael Bolton’s The Hunger album (although we probably shouldn’t mention that). Mark Gable has been the voice of Choirboys since the band’s inception and still is.